Power Morphicon Boom Studio Reveals- Introducing the Solar Ranger! Today the good people at BOOM! Studios take center stage at Power Morphicon to offer fans a quick look at the future adventures of their fan-favorite Power Rangers comic book series. *With the much-hyped SHATTERED GRID winding down, the time has come to look Beyond The Grid! This new phase of the story begins in Issue #32 of the comic. *A major character in this new story will be a comic original- the Solar Ranger! 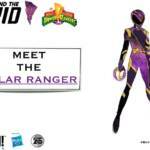 This purple & gold female Ranger is a BOOM! original creation! Her story will begin in January 2019. *Backing up the new Power Ranger team in Beyond The Grid is the Dark Ranger! This new character (a previously-unused concept from Power Rangers Dino Charge) is at last revealed in full, but out of respect for those who wish to go in unspoiled we will NOT be revealing his true identity here. PLEASE TAG ALL SPOILERS WHEN DISCUSSING! *Outside the grid, new adventures are coming to Go Go Power Rangers! This series will explore the story of Rita Repulsa and reveal at last how the Green Power Coin was obtained. *The original Mighty Morphin Power Rangers team goes through some unique changes in Go Go Power Rangers- including unpredictable color swaps and a VERY unexpected romance! These are currently scheduled for release in Fall 2018. Definitely some exciting times ahead for Power Rangers comics! Stay tuned to TokuNation as we keep you up to date on all BOOM! Studios reveals. And feel free to join in our Power Morphicon Boom! Discussion Thread to share your thoughts and fears about these new adventures!